Thanks my Father! It took this long but I am now working on my Windows 8.1 program—love it! Don’t know what will the day bring me, but whatever it is I know it’ll come from You! I questioned myself a minute ago—Why am living in my Father’s Presence? And You quickened me the parable of the Prodigal Son. I’ll write about that later after I finish installing the rest of my programs! Well, I’m having the time of my life with this computer! New things & new things everywhere I turn! How easy it is to get behind and stepped out of the picture if you do not go along with the new! I have yet to install my programs, but I am on my way to get with all of these new, new & new! I will try now to install and see what happens this time! O the time! Sometimes it flies! Sometimes it drags on & on! Right now it is not even 9 am and I have already done many tasks while I am waiting for my programs to install! But on the boot? It’s the 7th day of rest and I remain resting on You my Father! Truly, I squandered away the fortune of blessings You handed to me since even before I was born and now I have returned to You empty handed! What a blessing! Empty handed! Ready to become Your servant! Ready to remain in Your Presence and never go away from You again! Ready to love You for You not for my blessings! 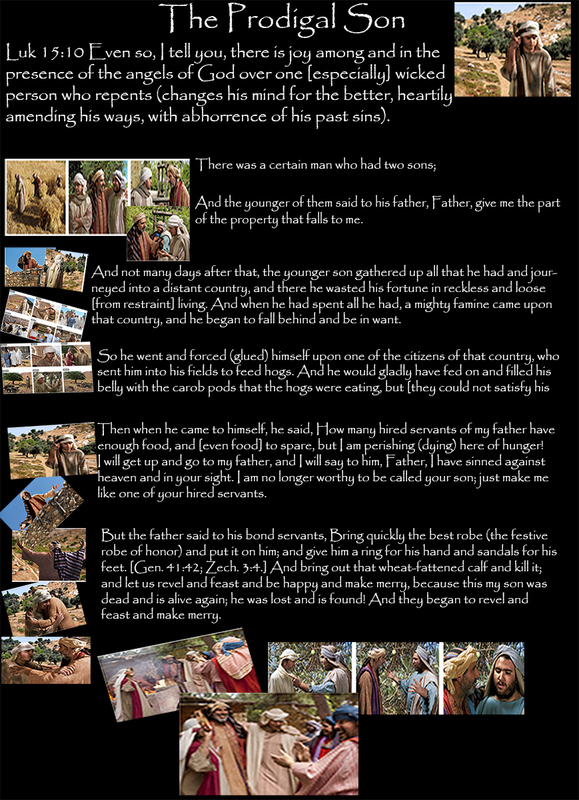 That’s the lesson from the parable of the Prodigal Son! Father, You have accomplished Your way with me! What am I talking about? Well, isn’t it the case with all of us? Think about it! Even before we were born we were blessed with a mother that did not get rid of us while in her womb! From there, either that mother or somebody nursed & pampered us lavishly in most cases! O that precious baby that we were! Soon we were not babies anymore, but still the care continued until we grew up! Honest to goodness! So much to reflect on! For our Father scheduled each day of our lives before they came about! So much for lamenting that I should have done this or that! All, and I mean all things were arranged together by our Father Creator! And in the economy of our lives He does not waste a second! Thus, at the moment Father has brought me to my senses and revealed these things to me as He has done for others in the past and in the present. I can now rest in the boson of my Father and let Him take care of me as well as take care of my loved ones! All things that He purposes to accomplish with my life are in the process. Still, I can now rest and enjoy my Father’s love and let Him enjoy mine! He loves me and I love Him! That’s all there is to it! The First & most Important Commandment to love Him above all is now a reality in my life! Thus the second commandment falls into place—I love my neighbor as I love myself! Wow! More & more every day I sense rest & peace and the ability not to worry or panic about any negative or tragic thing happening in my midst—I sense trust & confidence in You my Father! Sometimes I get good news that used to bring me to the peak of elation. Sometimes I get bad news that used to throw me into a state of panic. Now all of that is a thing of the past for me! In addition, when it comes to my computer? Hum! Panic is a mild word to describe my state! I would start clicking and doing one thing or the other including all kinds of support techs that have been forever patient with me! Now all of that is gone! No matter how severe that computer goes on the blink, I calmly study the problem & find the solution all by my lonesome! What a difference! Thanks my Father for bringing me to this point in my journey through this valley of death that we are all traveling in! You are my Shepherd—my Master and I do not want for anything! This day has come to an end with a good note in a way—we might be moving from this building? My wondering is, where will we go? When will we go? Should I start preparing for this move? I wait for Your development on this matter my Father. I know that all things are under Your control and I know that You are working all things for our good! Right now it’s 10:56 pm. I am going back to bed and hope You give Your beloved sleep! Thanks my Father! I had a good constructive chat with my friend and I finally got enough incentive to clean my stove—it needed a good cleaning! O my Father! It’s so good to rest in You! It’s so good to be able to wait on You with the knowledge that You are working all things together for our good even if Your good does not seem good to me! What do I mean? Well, for what I observe on the daily basis about the past & the present most all of us claim to wait on You—to wait on a You that is not clearly established in our minds & hearts! For example, most of my life You were not clearly established in my mind & heart as You are established now. But I was convinced that You were established and I live on that basis! I lived on that basis and no one could shake my conviction until You—my Father shook and brought my conviction to nothing in an instant of time when at least expected! I mean, in my conviction I was living in Your Presence and addressing You as my Father & Master and so far just like I do now. So? What happened? It so happened that on that 7th day of rest on September 15, 2007 I was keeping my day as I did at that time—I mean dedicating the day to read good things along with the Scriptures if there was not a way to attend a Shabbat gathering where I would sing & dance & listen to the preacher preach from the Torah then have a meal and fellowship with the group! I was compelled to do these things by the Messianic teachings I had just began to follow because those teachings seemed good & sound to me! So on that day since I could not attend the meeting I decided to read a good article from a sister that had fully committed herself to our Father! Wow! The impact of His voice made me get up immediately and go grab my case of pills—nearly $1000.00 worth of prescriptions drugs, I walked in the bathroom and emptied each bottle in the toilet then flushed them all away! I came back to the computer and wrote a letter of resignation to my position as a Senior Companion then grab the phone and cancel all my five specialist doctors’ appointments! And the rest is history recorded in the journal of my life! But why am relating this info here? To make the comparison between my convictions to live by certain standards and our Father’s conviction that such are not His standards! What is the difference? Big difference! My convictions then came from me and what I learned from the rest of my peers! The life that I am now living is the result of our Father’s conviction that my conviction to live by those standards was not from Him! Once my Father got my attention on that 15th day of September of 2007 my Father began to straighten out my crooked convictions and by now I do not live by any of the standards that I once lived by then! It took 7 years to straighten me out my crooked life living under my own convictions! Regardless! I can now see the full meaning of the parable of the Prodigal Son for I am that prodigal son/daughter!